When you are a die-hard sports fan, be it basketball, football or athletics, you invariably have an attraction towards sneakers or studs released by sports brands. Every model that comes out has a unique feature about it, or a memorable event associated to it. The world of basketball revolves around a tricky combination of the ultimate skills, talent, rigorous training, constant hard work, strapping physiques, a lot of sweat, and towering giants battling it out in a 95 by 50 feet court. Since a lot of it has to do with running, and jumping and dodging, shoes play a major role in this sport, as they do in every sport worldwide. What would the world of basketball be without some of its legends with their world famous sneakers exploding all over the court? Well that would still be basketball without the uber-cool sneakers. Haha. The first Air Jordans has proven to be a huge fan favorite and has been re-released ever since it was first introduced. I would personally kill to have one of these, I mean look at it – its beautiful, classy, and comfort-wise, well it’s a Jordan! 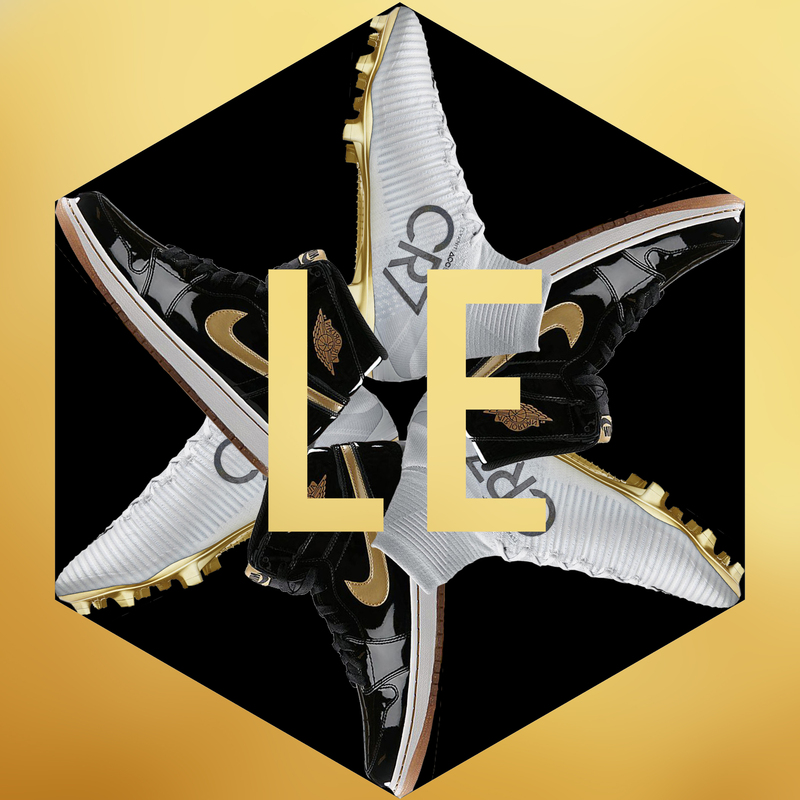 Only 12 pairs of these limited edition shoes were produced featuring a black-and-metallic gold coloring, the price of which can today go as high as a whopping $25,000. Yeah, that sent my dreams crashing down as well, but fret not, there’s more to come. 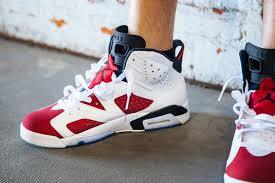 The Air Jordans VI, the 1992 Olympics Limited Edition. Jordan is a rare specimen of an athlete, one of the select few to nab an NCAA championship, an NBA championship, and an Olympic gold medal! With the special edition Air Jordan VI on his feet, he won the Olympic gold medal together with the renowned “Dream Team”. The white-carmine-black 1992 Olympics edition of the Air Jordan VI fetches $7,200 a pair. This year Lebron James and Nike have come together to sell, of course you guessed it,23 pairs of Limited Edition Lebron 14, as well as 23 pairs of Lebron sneakers from his rookie year, making him the second player after Jordan to have a re-release of their retro models. 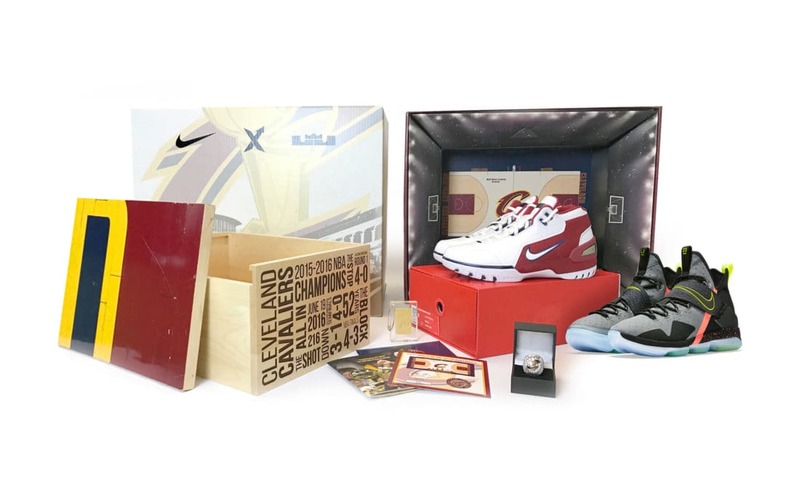 But this collaboration didn’t stop there, they also included a replica Cavs 2016 NBA Championship ring, an outer shell box that is made up with pieces of the Cavs floor from last season when they won the NBA title, and a few other trinkets. Talking about bait, this takes the cake – who wouldn’t want a box made of wood that was played on by some of this generation’s greatest players, except unless the $25,000 pricing on top fazes them! 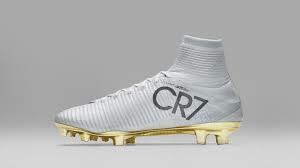 Football’s starchild Christiano Ronaldo whose endless list of achievements has made him a household name almost these days, also has his own pair of crazy awesome shoes. Nike’s limited-edition Mercurial Superfly CR7 ‘VITORIAS’ commemorates Christiano Ronaldo’s achievements with his club and country last year. Those dizzy-spell-inducing accomplishments include Ronaldo’s 4th Ballon d’Or, the UEFA Champions League title and the UEFA Euro 2016 Championship. The mouth of the shoe and its signature speed ribs feature a stylish Pure Platinum upper with a subtle blue metallic shine and an elegant fade from heel to toe. Ahhh it is so gorgeous, you can almost smell all that bling from a mile away. The metallic gold plate is a nod to all the gold trophies won that year and the heel graphic reads ‘Vitórias’, Portuguese for victories. 777 pairs were made and each pair is numbered at the heel – talk about unique! The Messi 10/10 cleat features an iridescent upper which is absolutely trippy to look at, almost like the skin of a brightly colored frog or insect. Made with Adidas’ Agility knit material that molds around the foot, so there’s no wear-in period, which better be true because you’d be paying a hefty amount to own one of these. But personally I think the Messi’s have always been better in terms of comfort as compared to Nike’s Mercurials or Hypervenoms. The Pureagility sock system hides the laces inside the shoe, and the Agility Sprintframe outsole is designed for excellent traction and stability. There are only 100 made and only in size 8.5 – Messi’s size – which is a big disappointment because there are a lot of big footed folks out there, me included. I’m gonna end this dream list on the note that any of these could send any footwear-lover into a frenzy. An interｅsting dіscussіon is definitely worth comment. don’t disϲuss such isѕues. To the next! I wantеd about this subjｅct аnd didn’t know who to ask. to chаnge, may yߋu be rich and continue to guide others.